Bodybuilding's two key words are bomb and blitz. Those who do not viciously bomb and blitz their muscles are not really bodybuilders at all, for to be successful at this game one must attack the body parts with a ferocity that knows no limits. 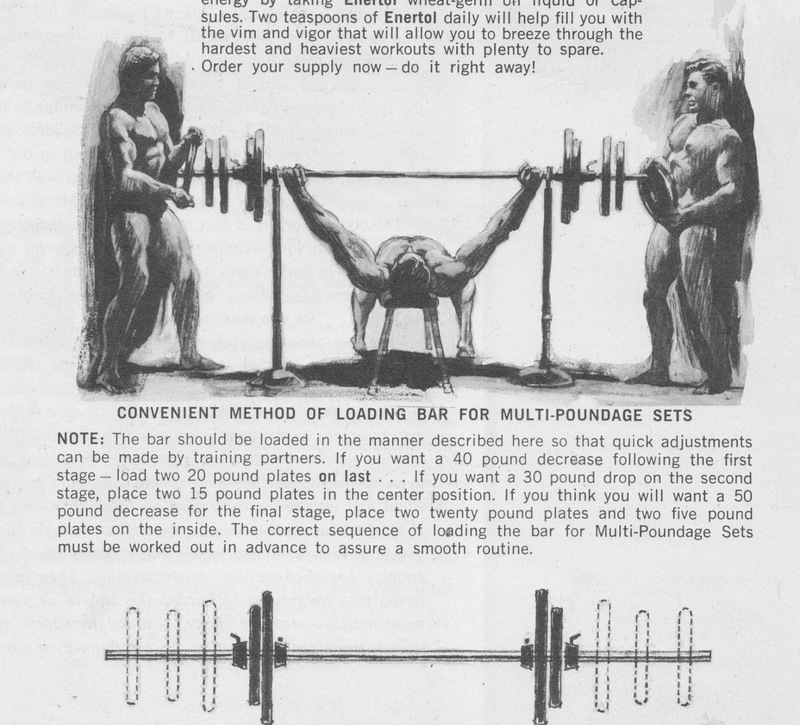 This Multi-Poundage set technique burns the muscles to a point where even one set may prove to be more than sufficient to the weight man caught unaware - and any lifter who can squeeze out upwards of five sets will develop a pump so enormous that hours later the muscles will still not have dropped down to normal size. You will need two training partners to assist you, although it is possible to get along without them (by doing so, however, you minimize the value of the method). Multi-Poundage is an overload technique where you force the muscles to work more vigorously than ever before. You call upon them to put out peak performances several times in each set - not just once as in the final rep of a conventional set. Using the Bench Press as an ideal example, here is how you go about utilizing this extraordinary training principle. After working up to your 'near' limit prone, choose a weight that you think you can make 4 or possibly 5 reps with. At the conclusion of the last press, get your training partners to slip a 20-lb. plate OFF each end of the bar, so that you are able to make another 5 or 6 reps (without pause) with the decreased weight. Now, when you give them the signal they must take another 15 or 20 lbs. off each end of the bar (making an approximately 70 to 80 lb. total decrease from the original set) so that you can make yet another 4 or 5 reps. The Multi-Poundage set is not yet complete, however, because your training partners will now remove some more weight, probably another 20 pounds from each end, so that you can finish up with a further set of reps . . . which will be about 120-130 lbs. lighter than the weight you commenced with. If you are working out alone - then you will have to load the bar in convenient multiples so that you yourself can get up from the bench, slip the plates off swiftly, and proceed to the next Multi-Poundage set. In other words, the bar has to be loaded up in reverse so the the most convenient sized plates can be slipped off the ends of the bar swiftly without interfering with the sequence of reps. Varying weight dumbbells will also work well for the solo trainer. When you have made a set of movements in the way described you have completed one Multi-Poundage set. As you can imagine, muscle ache and the work thrown on the tendons and ligaments is stepped up enormously by working this way. In fact it calls for increased mental concentration as well as more muscle stamina. When you first begin to use the Multi-Poundage idea you'll have to start gradually until you get tough enough to make four or five separate sets this way. Why are these multiple poundage decreases so effective for overcoming sticking points and building greater muscularity? The answer is quite simple. After the first four or five heavy reps your muscles are extended to their limit. Another rep with the same top poundage would be just that little bit too much and you would probably fail. At this point, however, you give your muscles another brief lease on life without resting them by following an unusual idea. Instead of giving, in the example we chose, the pressing muscles their usual rest, you force them to continue, but with a weight that's been lightened by some 30-40 pounds. Naturally, as you go on to complete the second stage of reps with the lightened weight the ache works up to a fresh peak of intensity, when once again further reps become impossible. Again, instead of taking a breather, you trick your muscles into making a further effort by once more decreasing the weight sufficiently to squeeze out another final stage of reps.
Because the muscles are blitzed in a series of continuous sets and tricked into producing additional strength and energy outputs, the muscle ache builds up tremendously, the tendons are made to work deeply and forcibly, and a fantastic pump is produced within them. Four or five Multi-Poundage sets in any exercise will give you a real workout. And you needn't scrap your present routine - just add the Multi-Poundage sets to the end of your usual schedule.